I am going through a term student program at my sangha and our first retreat was a week ago. Those of us attending had to prepare a presentation about ourselves. In preparation for this presentation we were to write three outlines: A historical outline, A karmic outline, and a spiritual outline. The exercise was interesting. It was fascinating to see what bubbled to the surface. I thought I would share my spiritual outline on my blog. 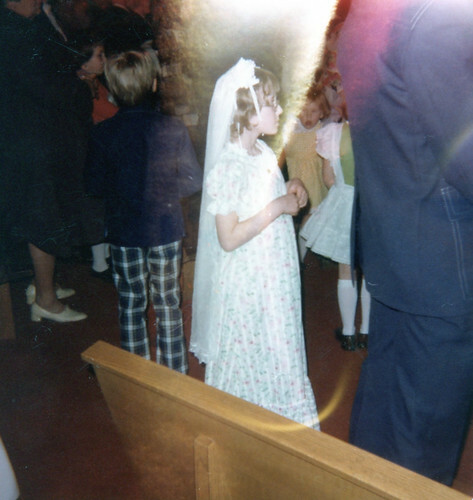 This is me at my First Communion, featuring a very interesting light leak. I became a born-again christian when I was 22. I had a very powerful conversion experience and I was very “gung ho” about following Christ. I read the entire Bible. I would spend hours studying the Bible and praying in tongues. I am actually really glad I had this experience because it was probably the only way I would ever read the Bible and I am glad that I read it. This experience led me to a Pentecostal church which was not a good experience for me. I think this church might have even been a cult. I left that church when I went to University and slowly drifted away from Christianity. It took a long time to “cleanse my brain” from the brainwashing that occurred from that experience. A lot of fear was planted in my at that time. I remember the day when I actually questioned the divinity of Christ and I didn’t feel fear. That was an incredibly good day. When I got to the place where I was able to question Christ’s divinity I explored other religions and was drawn to Buddhism. I have been reading about Buddhism for a number of years but have been a bit shy about jumping in with both feet. I think this is because of my experience with Christianity. I might always be a little gun shy because of that experience. Buddhism resonates with me. It allows me to look at other beliefs without guilt. I am a seeker, I have always been a seeker and I will always be one. Buddhism supports this aspect of myself and I love that. *At this point in my life I don’t believe in God. I guess technically I am an atheist, though I am still very spiritual. Can you be a spiritual atheist? I do believe in something inexplicable that connects all beings together. If that is God, then ok. I believe in whatever that is. That inexplicable thing IS God, if you ask me. God should be inexplicable. I don’t want to know the nature of God right now. I enjoy the journey too much to want to arrive at my destination already. For me it’s like if u believe in God then should believe in Devil as well. What ever has happened to you at Pentecostal Church but my view is don’t think that there is no God. There is truth n lie in every religion its just which path you want to go for. Always follow the path of truth and be happy in whatever u do. Pray not for yourself but do pray for others. Humanity is what u should believe in not religions or God. I definitely don’t believe in the devil or hell or any of that. I am happy with the philosophy of Buddhism. There is no god or devil or hell in Buddhism and I’m just fine with that. It’s like you said, everyone has their own path.